Two Vintage Work Weekends have been completed. Check out the photo gallery. Although we have a contractor doing work on the Red Barn, Vintage Volunteers have been completing the electrical work. The hospitality side of our barn is getting a much needed update with plenty of new things and some surprises. The Red Barn is open Sunday through Saturday during AirVenture. Make sure to check it out during AirVenture. 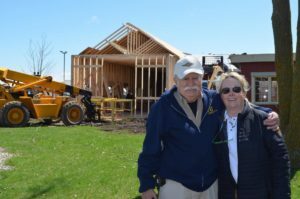 Vintage VP Dave Clark and President Susan Dusenbury are pleased with the many improvements being made to the Vintage Village. Thank you, Volunteers. Vintage Volunteers have already completed a new Courtesy Charging Center to be located west of our Red Barn. The building is complete, pannelled, all electrical completed. Now all it needs is paint and it is ready to move to its new site. Mike Blombach is chairman of our maintenance committee assisted by co-chair Wayne Wendorf. Volunteers led by Jim Cuningham have catalogued and priced dozens and dozens of cases of donated aviation books for our Vintage Bookstore open Monday through Friday during AirVenture. Some of these books are true collectibles. Volunteers led by Aeromart Chairman Paul Kyle have been hard at work tagging and organizing aircraft parts and aviation-related items. Aeromart operated by Vintage Volunteers and is located at the Fly Market. Aeromart is open for browsing and sales Monday through Friday during AirVenture. Learn more about Aeromart or pre-order sales tickets here. Our next Work Weekend is scheduled for June 23-24 with many workers arriving on the 22nd. We provide great meals and housing if you need it. Contact Maintenance Chair Mike Blombach here to let us know you are coming. Below are just samples of what we do during these work weekends. Click on any image to see it full size or to start a slideshow. Join us for a great time June 23-24.